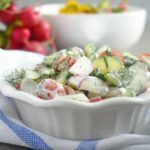 Tomato Cucumber Radish Salad: quick and easy, flavorful, so refreshing, so creamy and full of vitamins. 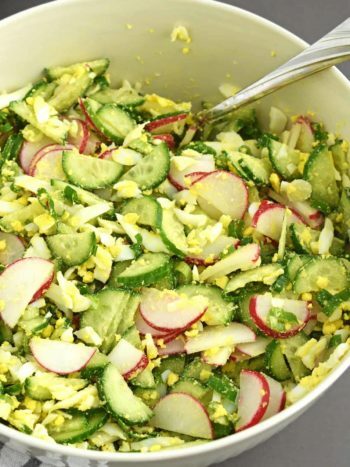 This salad is loaded with crunchy cucumbers and radishes plus few other simple ingredients. 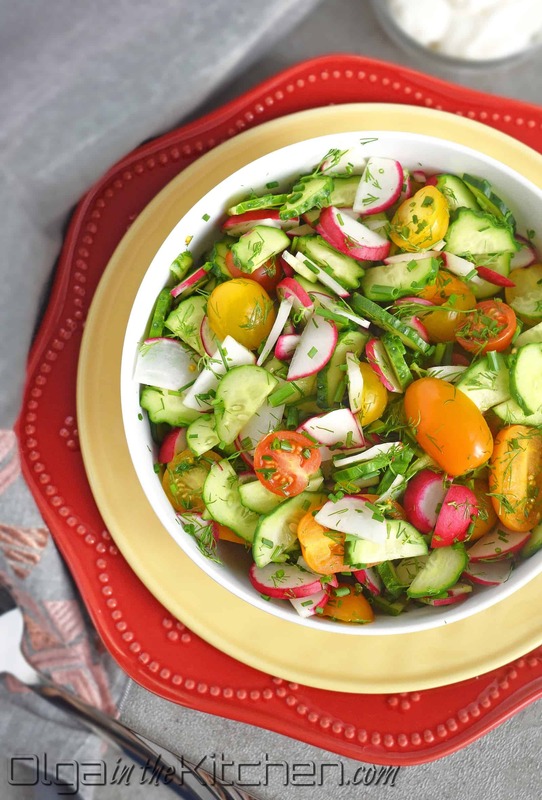 It’s the favorite summer salad! 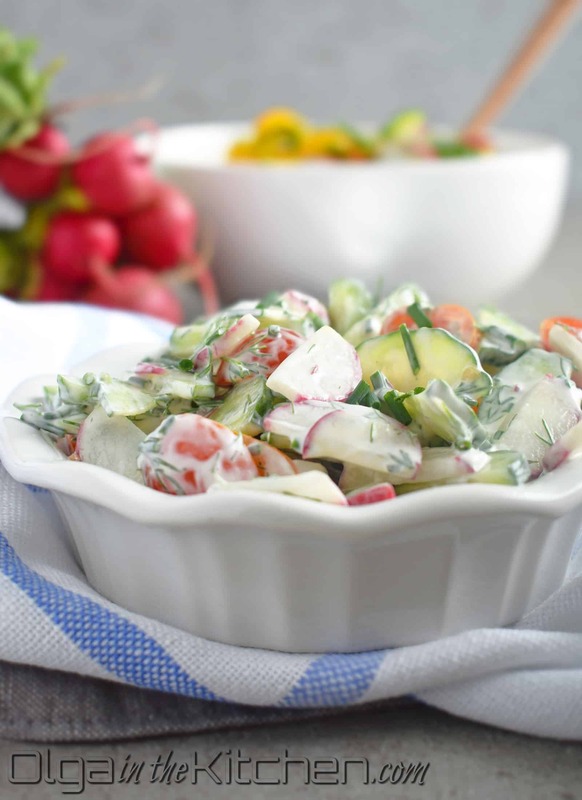 Did you know that radishes are very nutritious and really good for you in every way? They are rich in Vitamin C and folic acid, they also improve your immune system. There’s a really long list of great benefits when it comes to radishes! Final word…if you don’t eat radish, you should! I remember we used to grow radishes back in Ukraine and we would snack on them as candy. I myself grew these last couple years in my garden as well. The best salads always get created when you have whatever vegetables on hand. This was another ‘spur of the moment’ salad, with the easiest creamy dressing that just brings all the flavors together. By this time, you probably learned few things about my eating habits: I love salads and I love desserts! A perfect balance to the daily calorie intake (not that I ever counted them lol). When it comes to homemade meals, calories don’t count! 1. Slice 3 medium cucumbers and 1 bunch radishes. Cut into half all the plum or cherry tomatoes (10 yellow, 10 orange, and 10 red). Add the prepared vegetables into a large bowl. Finely chop 1 bunch chives to equal to 1/4 cup and 1 bunch dill to make 1/4 cup. Add prepared fresh herbs to the bowl with salad and gently mix with a spoon. 2. In a small bowl, combine and stir together, 1/4 cup sour cream, 1/4 cup mayo and 1/2 tsp kosher salt or to taste. Refrigerate the dressing until ready to serve. 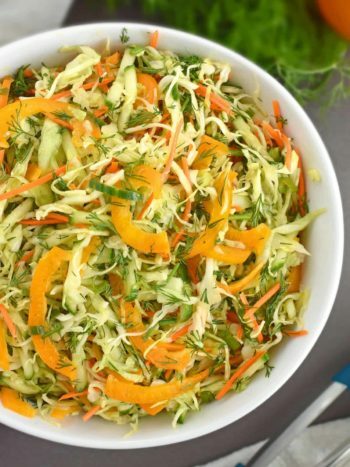 Refrigerate dressing-free salad for a day or 2 max until ready to serve. Do not store for prolonged time as the tomatoes will start get watery and radish will change its flavor. Just before serving, stir the salad to coat in dressing. Add more salt to taste if necessary. 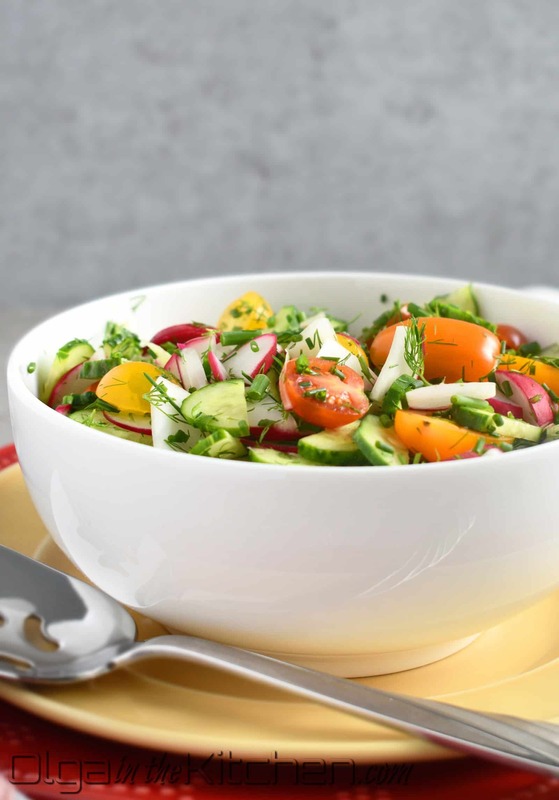 Tomato Cucumber Radish Salad: quick and easy, flavorful, so refreshing, so creamy and full of vitamins. 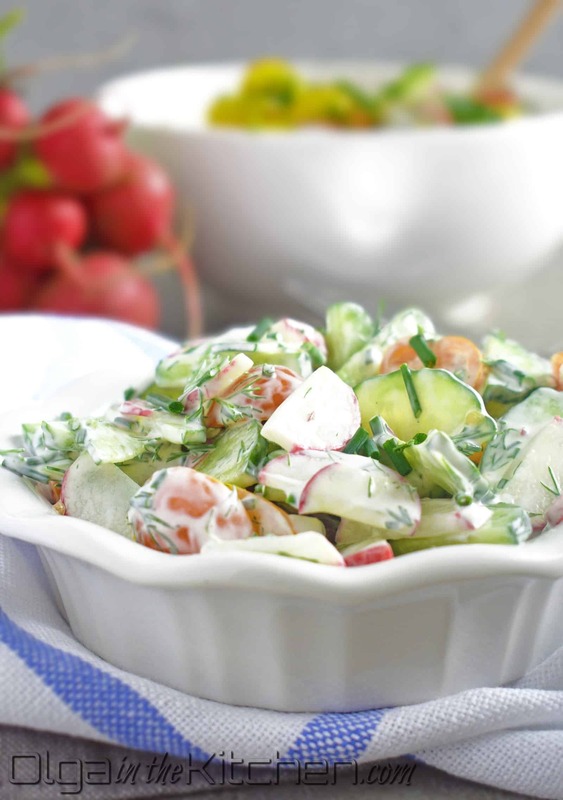 This salad is loaded with crunchy cucumbers and radishes, plus few other simple ingredients. Slice 3 medium cucumbers and 1 bunch radishes. 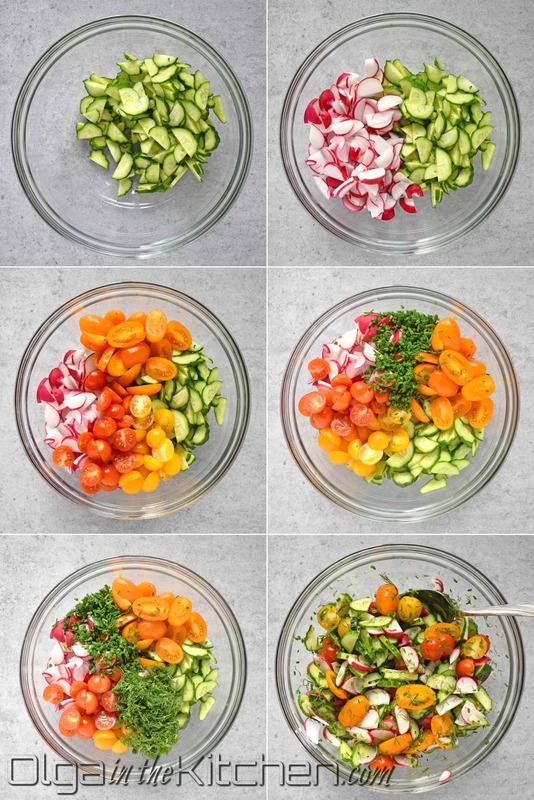 Cut into half all the plum or cherry tomatoes (10 yellow, 10 orange, and 10 red). Add the prepared vegetables into a large bowl. Finely chop 1 bunch chives to equal to 1/4 cup and 1 bunch dill to make 1/4 cup. Add prepared fresh herbs to the bowl with salad and gently mix with a spoon. 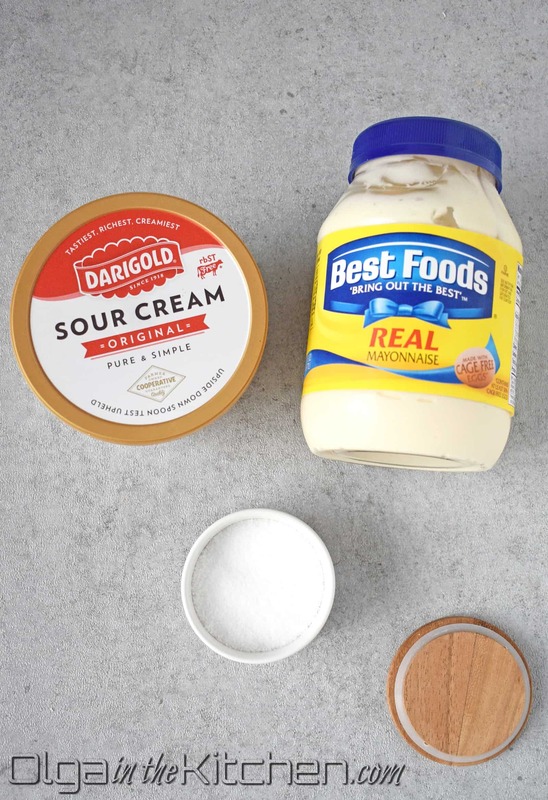 In a small bowl, combine and stir together, 1/4 cup sour cream, 1/4 cup mayo and ½ tsp kosher salt or to taste. Refrigerate the dressing until ready to serve. Refrigerate dressing-free salad for a day or 2 max until ready to serve. 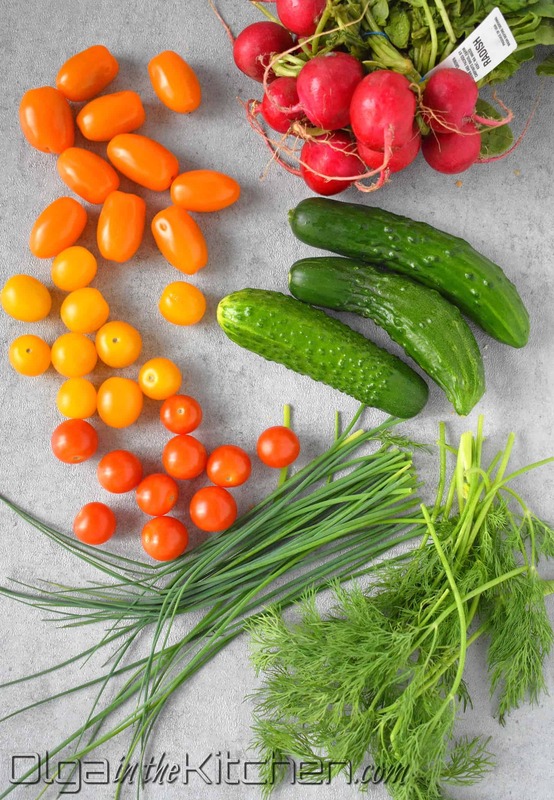 Do not store for prolonged time as the tomatoes will start get watery and radish will change its flavor. Just before serving, stir the salad to coat in dressing. Add more salt to taste if necessary. This is another incredible salad. I’m a salad person and you have such great collection of them, I keep looking for more and more of your salads. They are all so different than the usual everyday salads and much tastier too. 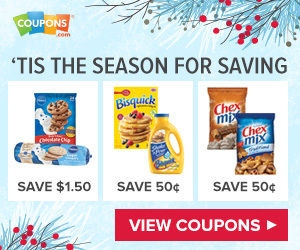 I’m already planning my Thanksgiving and Christmas food menu and I’m using all of your salads; 4 each holiday. Thank you, can’t wait for more! Thanks Riley, I’m happy to hear my recipes will be served on the major holidays? I myself am a salad person too, and I have so many more coming. Stay tuned!! 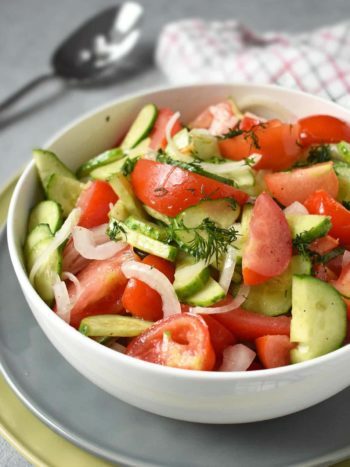 Such a delicious salad, thank you for the recipe!